Hundreds of years of war and plague had reduced the once mighty Empire of the Jaguar Kingdom to a shadow of its former glory. 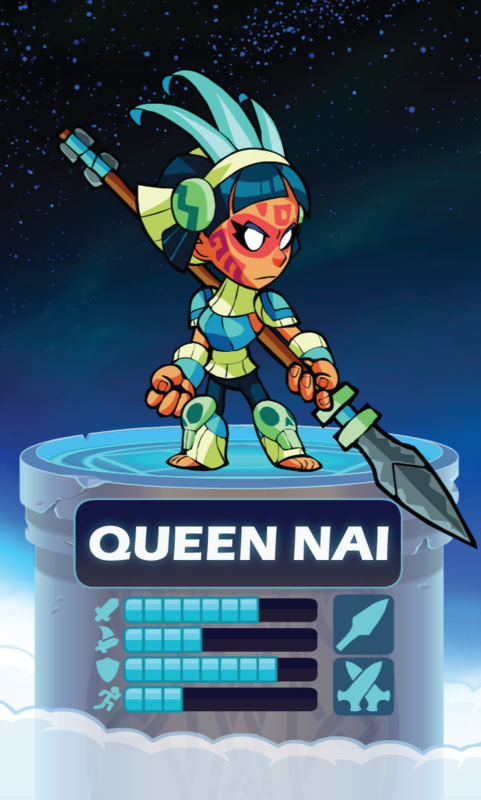 Neither the brilliant battlefield victories nor the cunning sorcery of the great Queen Nai could stem the tide of decline of her people or of her gods – a once great pantheon now faded to near extinction. Seeing that her civilization’s doom was sealed, Nai made a plan. She cast a spell, drawing into herself the essence of the eleven surviving gods of the Jaguar Kingdom. And when, during the Battle of Ixanocala, a Valkyrie offered Nai a place in Valhalla, she accepted, carrying Xanlecutli the Coatl, Eba the Snake, and nine other ailing gods with her to the great hall. In Valhalla, Nai is a consummate warrior and has grown to love the place. Yet she never loses sight of her purpose – her victories nourish the gods of her people, and little by little they recover. Nai believes tales of Ragnarok represent Asgardians’ dim understanding that creation is cyclical and that Asgard must be destroyed for the world to be renewed and for her gods to rule again.